What a wonderful, thoughtful gift. STUCK FOR A thoughtful Valentine’s Day gift for your significant other? Try this guy’s method, and see if it works out for you. Kleenex offers ‘care packs’ full of tissues to send to your loved ones, along with a personalised greeting card. 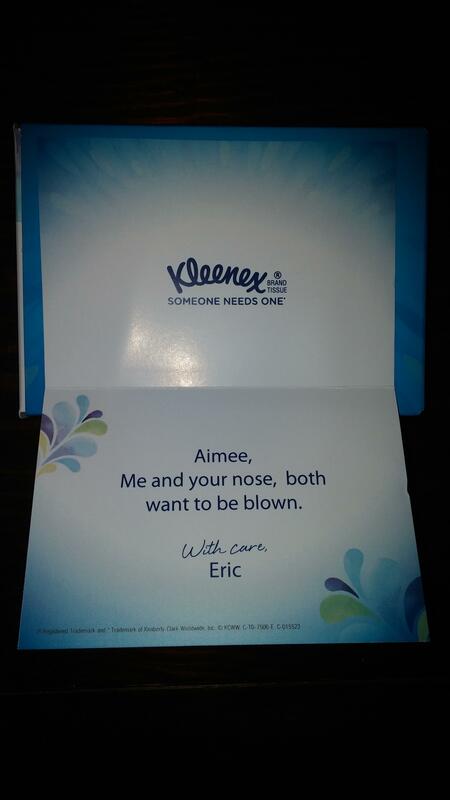 Redditor Eric decided to send one to his girlfriend Aimee as a Valentine’s gift, quickly discovering that they don’t screen the personal notes. Wow. She’ll be knocked off her feet. Email “This guy is either Valentine's Day's biggest winner, or its biggest loser”. Feedback on “This guy is either Valentine's Day's biggest winner, or its biggest loser”.